Rehearsal Incredible String Band film. Performance in the play entitled “U” by the Incredible String Band at London’s Roundhouse Theatre and the Fil-more East in New York City. Film 1973 Appearance in the James Archibald film. 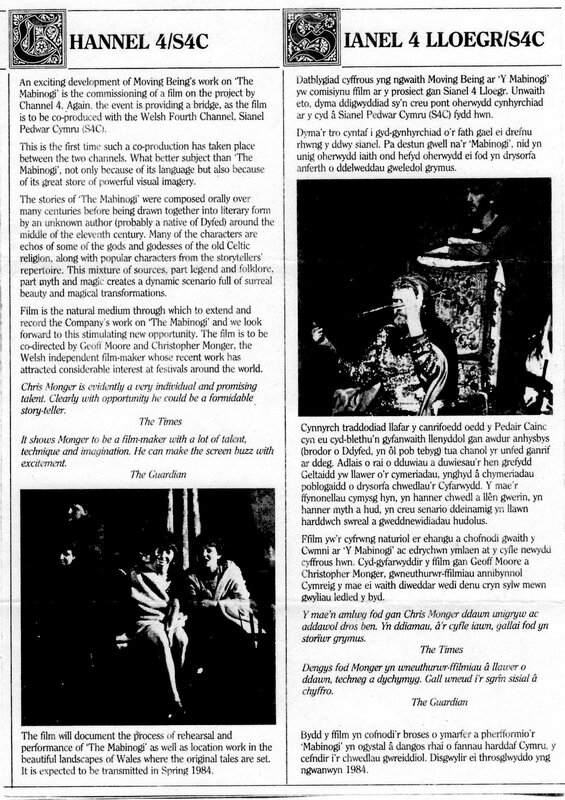 Appearance in the American Film Institute production, featuring Eduard Franz and Diana Douglas, with Robin as “the watcher.” Screened in Hollywood, November 1979.
International Festival Fringe August 1982. Also presented on Scottish and Welsh Arts Council tours, Spring 1983. 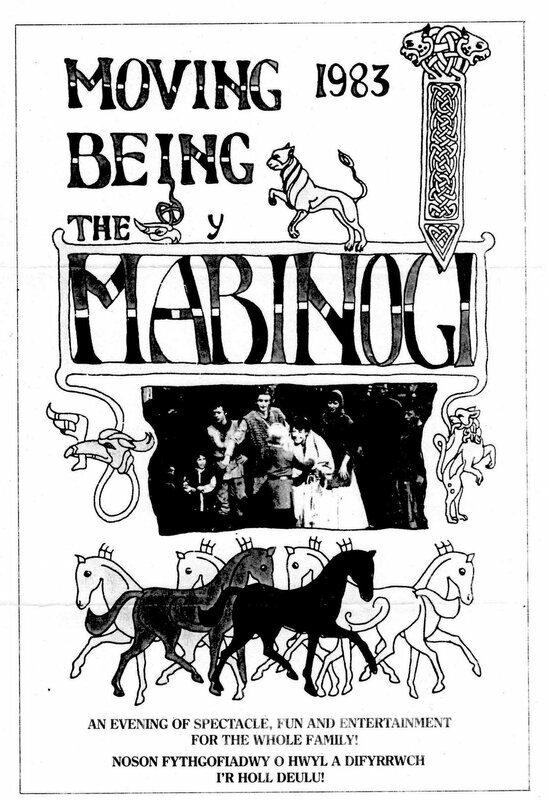 The Mabinogi– multi-media theatre production 1981 Music composed for a presentation of the Mabinogion, a cycle of ancient Welsh legends, as performed by thetheatre dance company Moving Being at Cardiff Castle,Wales, April 1981. Open air production, Caernarfon Castle, May/June 1983 and Cardiff Castle, August 1983; Channel Four TV, 1984. The Dragon Has Two Tongues – Television Score 1984 -13 part Welsh history series for Channel Four TV. Prospect of the Sea – theatre 1984/85 – Moving Being and Robin; theatre/dance portrait of Dylan Thomas. Every Window Tells a Story – television theme music 1986 – Six week series on Channel Four TV, Spring 1986. Paintability – televisión theme music 1986 – Six week series on Channel Four TV, Spring 1986. The Mabinogion-The Arthurian Romances – theatre 1986- St. David’s Hall, Cardiff, Wales. August 1986. Hi to all… I would like to share with you this letter by Robin Williamson which was part of our 1984 mailing. I decided to post it not only because it has comments regarding the Mabinogi (it is to note that he employed keyboard layers also for The Dragon Has Two Tongues cuiously related to Wales too! ), but also to show up his vast work releases of those days. Undoubtedly,Robin has always been a constant composer and researcher indeed. Hi to all… I would like to share with you the scan of part of the Official Programme for the Mabionogi shows, with artwork by Janet Williamson. Let us recall that the album Music for the Mabinogi by Robin was the complete score of the presentations. The stage productions along with the Moving Being Company directed by Geoff Moore were held with Medieval Fairs previ ous to the shows at Cardiff Castle through Aug 18th-29th, and at Caernarfon Castle through May 28th-June 8th. As shown, these performances in both Welsh and English languages,were filmed as a coproduction by S4C and Channel Four TV for 1984 releases in Britain. I would much appreciate comments of anyone who owns a copy of this broadcasts! 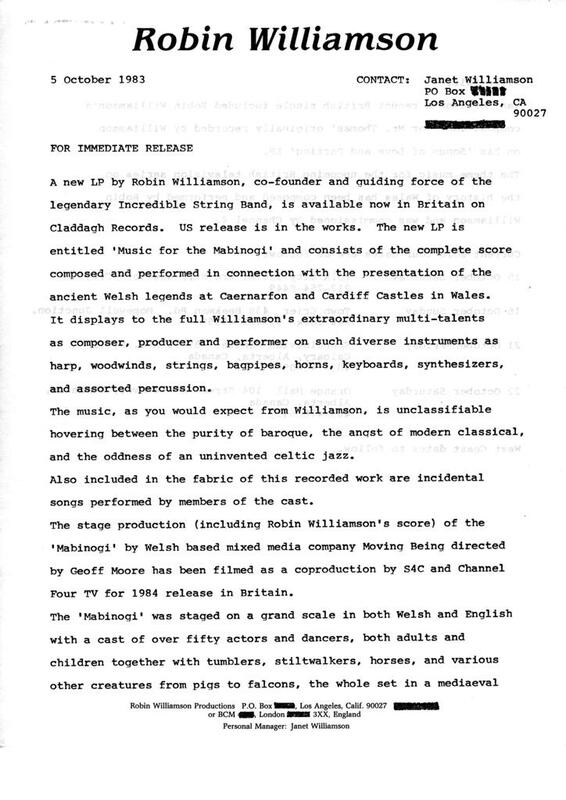 Hi to all…hereby I would like to share with you this 1983 Press Letter concerning “Robin Williamson’s Music for the Mabinogi Album Release” . Note that it is dated after the official stage performances in Wales.